Sometimes there’s nothing better than a thick, filling bowl of soup. 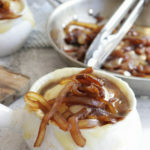 This low carb, French Onion Soup recipe starts with a bone broth base, caramelized onions and garlic, and a delicious layer of cheese to seal the deal. This soup can be eaten by itself or paired with a delicious serving of cloud bread, a slice of almond bread, or a few rosemary crackers. An onions composition is great for nurturing many aspects of the body but one that stands out is its ability strengthen bones by reducing the risk of fractures. Some studies have shown that by consuming onions once per day will have greater bone density than those consuming onions once per month or less [*]. Another study was conducted on patients with osteoporosis. One group was given onion juice and another a placebo for eight weeks. Those who consumed onion juice showed major improvements in regards to bone loss and bone mineral density by restoring antioxidant activities [*]. Garlic, a family member of the onion, has some pretty incredible health benefits for your bones, as well. A study conducted on postmenopausal osteoporotic women found that consumption of garlic, over a one year period, showed a great reduction in the proteins oxidative biomarkers that lead to bone diseases, like osteoporosis [*]. A few more studies, conducted on rodents, showed that by consuming garlic it reduced bone loss by increasing estrogen in the female rodents specifically [*][*][*]. We know by now that bone broth is basically liquid gold. If you didn’t know that, well now you do and remember it always. By consuming more bone broth, you’re also getting the collagen and gelatin that bone broth contains. Think of collagen like gorilla glue. Not just your typical elmers glue, but the thick glue that holds and keeps things in place… that is what consuming collagen does. It rebuilds and holds things in place, allowing them to work properly without pain. Things like cartilage, tendons, and joints. As we age everything begins to slow down, like our production of collagen (hello fine lines and wrinkles). Joint pain becomes more of beckoning ex-lover that won’t leave you alone. The saddest part is that all of this starts to happen at the good ole age of 25. After 25, collagen production drops about 1.5% per year. That number doesn’t seem like much; however, if you’re not finding ways to consume collagen, you’ll probably start to feel the side effects of collagen deficiency sooner rather than later. In the fall and winter seasons it’s important to strengthen your body’s defenses against illnesses such as the flu or common cold. Fortunately this recipe acts as a delicious dose of medicine. Garlic has long been known to promote health and immunity. When a garlic clove is crushed, it releases an enzyme called Allicin, as a defense mechanism. This natural enzyme also provides valuable defense to your body as well. Studies have shown how Allicin can have a significant positive impact in your defense against common colds [*]. The foundation of your immune system is your gut, which means you should make sure to support your gut health in order to maximize your immunity. Bone broth is one of the best remedies for repairing damaged intestinal walls and protecting your gut over time. It also decreases inflammation in your gut allowing you to properly digest foods and absorb beneficial nutrients [*]. One of the most significant benefits of this savory soup is its ability to help your body fight against cancer. Onions and garlic come from the same allium cancer-fighting family. May studies have been conducted on their abilities to suit-up and prepare for battle. One organized study done in southern Europe showed that consuming both onion and garlic had a favorable correlation with reducing the risk of cancer [*]. Garlic specifically contains a compound called N-benzyl-N-methyl-dodecan-1-amine (BMDA for short). One study was able to extract this compound by the reductive amination method and was found to have a very promising anticancer properties against cancer cells overgrowing [*]. Now that you’re familiar with all the goodness this keto French Onion Soup recipe has to offer, let’s get to the recipe so you, too, can reap the benefits! Melt butter in a large stock pot over medium-high heat. Add the onions, garlic, bay leaves, thyme, and salt and pepper and cook until the onions are caramelized (about 15 minutes). Discard bay leaf. Reduce heat down to medium-low. Add the beef broth and 1/4 teaspoon of xanthan gum, bring the soup back to a simmer, and cook for 10 minutes. Add more xanthan gum for thicker soup of desired, adding only a pinch at a time. Portion soup into bowls. Before serving, sprinkle each bowl with grated cheese. Broil until golden brown and bubbly. For a more traditional French onion soup recipe, use a slice of prebaked 4-ingredient keto almond bread in soup. Toast bread well, add to soup, then sprinkle with grated cheese, and broil. It tastes very good, I wish I had a soup bowl I could put in the oven! I added up the macros for this soup and the net carbs were closer to 11g. Might be safer to call this low carb? Onions and gruyere both have a lot of carbs.